NASA’s Cassini spacecraft discovered a static hexagonal storm four times the size of Earth crowning Saturn’s north pole, including a clearly defined eyewall. Based on its size and movements, scientists have concluded that it’s a vast cloud pattern generated by a gigantic, perpetual hurricane spinning at the center of the planet's north pole. Scientists estimate that this storm has been raging for decades – maybe even centuries. Each side on the northern polar hexagon is approximately 13,800 km long, and the whole structure rotates once every 10 hours and 39 minutes -a day on Saturn. In just four years, Saturn’s hexagon has changed its color from blue to gold when Saturn's north pole gears up for next year's summer solstice. Saturn’s hexagon is a six-sided structure that spans roughly 32,000 km (20,000 miles) in diameter, and extends about 100 km (60 miles) down into the planet’s dense atmosphere. Because Saturn does not have land masses or oceans on its surface to complicate weather the way Earth does, its conditions should give scientists a more elementary model to study the physics of circulation patterns and atmosphere, said Kevin Baines, an atmospheric scientist at NASA's Jet Propulsion Laboratory, Pasadena, Calif., who has studied the hexagon with Cassini's visual and infrared mapping spectrometer. The last visible-light images of the entire hexagon were captured by NASA's Voyager spacecraft nearly 30 years ago, the last time spring began on Saturn. After the sunlight faded, darkness shrouded the north pole for 15 years. Much to the delight and bafflement of Cassini scientists, the location and shape of the hexagon in the latest images match up with what they saw in the Voyager pictures. The hexagon was originally discovered in images taken by the Voyager spacecraft in the early 1980s. It encircles Saturn at about 77 degrees north latitude and has been estimated to have a diameter wider than two Earths. The jet stream is believed to whip along the hexagon at around 100 meters per second (220 miles per hour). Early hexagon images from Voyager and ground-based telescopes suffered from poor viewing perspectives. Cassini, which has been orbiting Saturn since 2004, has a better angle for viewing the north pole. But the long darkness of Saturnian winter hid the hexagon from Cassini's visible-light cameras for years. Infrared instruments, however, were able to obtain images by using heat patterns. Those images showed the hexagon is nearly stationary and extends deep into the atmosphere. They also discovered a hotspot and cyclone in the same region. As observed by NASA’s Voyager and Cassini spacecraft, each point of the hexagon appears to rotate at its center at nearly the same rate that Saturn rotates on its axis. Along the rim of the hexagon, a jet stream of air is blasting eastward at speeds of 321 km/h (200 mph). While we’re pretty confident that we know what Saturn’s hexagon is, the big mystery is how it got there in the first place. Once you have a giant whirlpool of air, it’s relatively easy to keep it spinning – but the force you need to get it wound up in the first place is a whole lot more difficult to explain. The best hypothesis is that this is what it looks like when Saturn changes seasons. With a year that lasts 29 Earth years, Saturn changes seasons only once every seven years, and the increased sunlight over the past three years could explain the golden haze. "The color change is thought to be an effect of Saturn's seasons. In particular, the change from a bluish colour to a more golden hue may be due to the increased production of photochemical hazes in the atmosphere as the north pole approaches summer solstice in May 2017." "Inside the hexagon, there are fewer large haze particles and a concentration of small haze particles, while outside the hexagon, the opposite is true," Kunio Sayanagi, a Cassini imaging team associate at Hampton University, explained back in 2013. "The hexagonal jet stream is acting like a barrier, which results in something like Earth's Antarctic ozone hole." 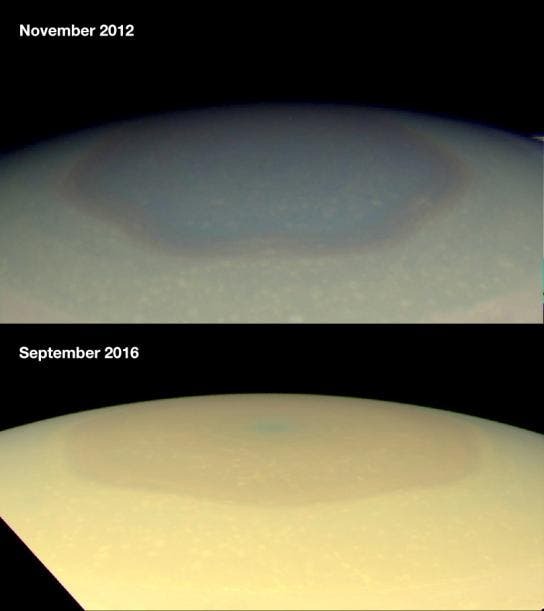 But since Saturn reached its equinox in August 2009 – the point where the Sun is directly over Saturn's equator – it's been gradually exposed to more and more sunlight, which means that for the past three years, aerosols have been produced inside of the hexagon and around the north pole, making the polar atmosphere appear hazy and golden when photographed last month. "Other effects, including changes in atmospheric circulation, could also be playing a role," NASA explained this week. "Scientists think seasonally shifting patterns of solar heating probably influence the winds in the polar regions." NASA scientists have an investigation underway to figure out what's actually going.